Readers of this site, and my Twitter friends, know that I like food and cooking….but don’t call me a Foodie. Much of what I cook tends to be seasonal, and I find myself preparing Southeast Asian dishes in the fall and winter, and Mexican meals in the summer, but I’ll swap over from time to time. In the summertime, when we have an abundance of cherry tomatoes from garden, we love preparing these TLTs: Tempeh, Lettuce, Tomato Sandwiches. Now, these flavorful beauties aren’t Asian, but the tempeh is. Tempeh (or often tempe) is a traditional Indonesian food made by culturing and fermenting soybeans into a firm cake. It is much, much denser than tofu, and has an earthy, nutty flavor. Because it is nutrient dense, and a good source of protein, it has been adopted by vegetarians in the western world and used as a burger or meat substitute, like in the sandwich linked above. There are many different styles and types of tempeh. The one I pick up at Trader Joes is made from grain, but there are a host of others, including beans and even okra. But one type I wasn’t familiar with was tempe bongkrek. 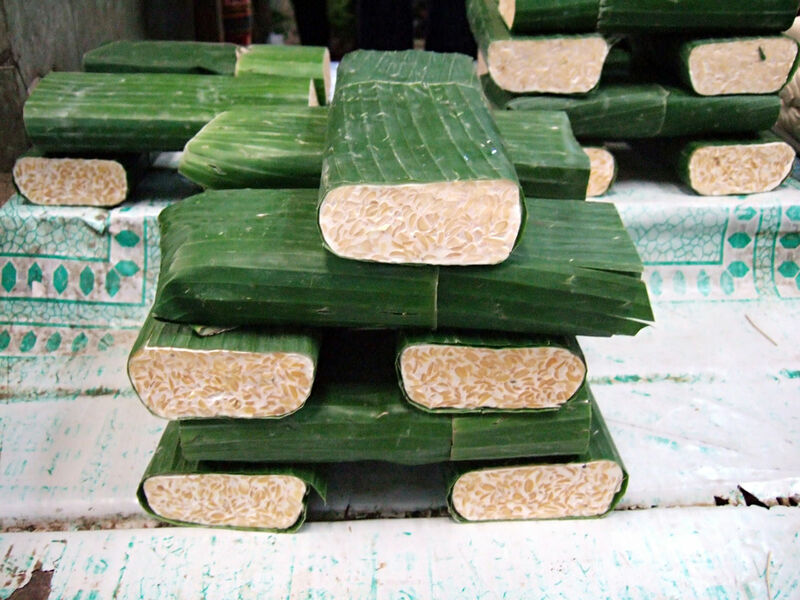 Made from coconut, tempe bongkrek originates from the island of Java, a part of Indonesia. It is made by fermenting coconut presscake or coconut milk with the fungus Rhizopus oligosporus. When the mold grows, the thin, fluffy, vegetative strands called mycelia physically binds the coconut (or soybean, grain, etc.) together to form the cake, and the more mycelia, the better the tempeh. Or so I’m told. Before this post I had no idea how tempeh was made. . . I wish I still didn’t know. But if you thought moldy tempeh was bad, it gets worse. Enter bacteria. Burkholderia cocovenenans, an aerobic gram-negative bacteria, is associated with food-borne poisonings, and multiple deaths annually, to those that consume tempe bongkrek. In Indonesia between 1951 and 1975, an average of 288 poisonings and 34 deaths were reported each year. The widespread bacterial contamination, and resultant human illness and death, led to the prohibition of manufacturing and sales of tempe bongkrek in 1975. But due to its popularity, low price, and flavor, it is still made in clandestine kitchens – I imagine there’s an Indonesian version of Heisenberg out there, cooking up tempe bongkrek. The causative agent, produced by Burkholderia, is bongkrekic acid, naturally. The first studies on the toxicity of Burkholderia was initiated in 1930, with bongkrekic acid being isolated in 1934. The toxicity of bongkrekic acid is general in nature, and early studies showed it to be toxic to every experimental animal (monkeys, rats, rabbits, and pigeons), and surprisingly towards other bacteria, yeasts, and molds. In humans though, toxicity manifests within a few hours of ingestion and presents with abdominal pain, general discomfort, sweating, fatigue, and eventual coma. Death can occur within 24 hours. What is happening clinically is an initial hyperglycemia, and a complete elimination of glycogen in the liver, followed by fatal hypoglycemia. In layperson terms, glycogen stores in muscle and the liver is our secondary long-term energy storage, with fat being the primary. When needed, glycogen is broken down into glucose, which we use for fuel in all parts of our body. So what is happening is our glycogen stores in the liver are broken down to glucose, creating an excess in the blood (hyperglycemia), which is consumed within minutes. Now when we need glucose, the body calls up the liver asking for glucose, only to be told “Sorry, we’re sold out.” Feeling dejected, we curl up into the fetal position, start sweating, shaking, have a few seizures, then die from hypoglycemia. All of this happens because bongkrekic acid is an adenine nucleotide translocase inhibitor as well as an inhibitor of oxidative phosphorylation in the mitochondria. Our “molecular unit of currency” is adenosine triphosphate (ATP), and bongkrekic acid prevents it from being formed by blocking adenosine diphosphate (ADP) from being transported into the mitochodria, and its phosphorylation to ATP. In essence, cellular respiration, on many different levels, is shut down. Our cells are literally robbed of fuel. I’m going to say it’s complex – and this is important – when a scientist says it’s complex, what we are really saying is “I don’t fully understand it myself” or “I’m not smart enough to explain it.” Sorry, but there’s a really good reason why I went into organic chemistry instead of biochemistry, and this is it. For more in depth reading on ATP-ADP translocase inhibition, check the last reference. Getting back to Burkholderia cocovenenans, one could wonder why we don’t see this bacterial infection, and consequent formation of bonkrekic acid, in all types of tempeh. It turns out that bacterial growth and bongkrekic acid is directly proportional to the amount of fat present. In high fat coconut, bongkrekic acid starts to increase at about 20% fat. In concentrations of 10% fat, like low-fat coconuts and soybeans, bongkrekic acid is undetectable, even with high bacteria counts. Cool, huh? So if you’ve never tried tempeh, the recipe above is a great place to start – and as a whole, Heidi’s website 101 Cookbooks is fantastic. And if you’re the traveling type, and happen to find yourself in Java, stay away from the Djenkol beans…and the tempeh bongkrek. Nugteren, D. H., and W. Berends. “Investigations on Bongkrekic Acid, the Toxine from Pseudomonas Cocovenenans.” Recl. Trav. Chim. Pays-Bas Recueil Des Travaux Chimiques Des Pays-Bas 76.1 (1957): 13-27. Garcia, Rafael A. “The Effect of Lipids on Bongkrekic (Bongkrek) Acid Toxin Production by Burkholderia Cocovenenans in Coconut Media.” Food Additives and Contaminants 16.2 (1999): 63-69. Henderson, P.J., Lardy, H.A. “Bongkrekic Acid: An Inhibitor of the Adenine Nucleotide Translocase of Mitochondria.” The Journal of Biological Chemistry 245.6 (1970):1319-1326. Tags: ATP, bongkrekic acid, Burkholderia, Burkholderia cocovenenans, coconut, food poisoning, hyperglycemia, hypoglycemia, Java, Rhizopus oligosporus, tempe bongkrek, tempeh. Bookmark the permalink. Previous post ← Domoic Acid: The Amnesic Shellfish Toxin that…what was I saying? I was excited about trying tempeh at the beginning of the article, but after reading about how it’s made I am not so sure. Sorry, dude. It is a bit like knowing how hotdogs or sausages are made. But for what it’s worth, now that I know, I’ll still eat it. It’s just fungus, like mushrooms. So what does it taste like – just like grainy mushrooms? The soybeans and/or grains are chunky, so it’s got some texture to it, and I think it’s more of a mild nutty, earthy flavor – a mushroom flavor may not be too far off. It’s not something I eat plain. I like it best heavily marinated and grilled – like those TLTs. Give it a shot. Cool post. It’s weird how beholden we are to the metabolic preferences of poison-producing microbes. Not much fat in that coconut? Guess I won’t lace it with bonkrekic acid! I am Indonesian and live close to the area of production of tempe bongkrek. This tempe is not the tempe you can see nowadays. The tempe is not made from soybean as you see these days, but it was made from shredded coconut waste after the coconut milk has been collected. The bacterial contamination can occur and lead to fatal poisoning. The bongkrek tempe is definitely made by low income community. The production has been banned by the government since 1970’s.